The Gordie Howe International Bridge project is a planned bridge and border crossing spanning the Detroit River and connecting Detroit, Michigan, U.S. and Windsor, Ontario, Canada, by linking Interstate 75 and Interstate 96 in Michigan with the new extension of Highway 401 (Rt. Hon. Herb Gray Parkway) in Ontario. 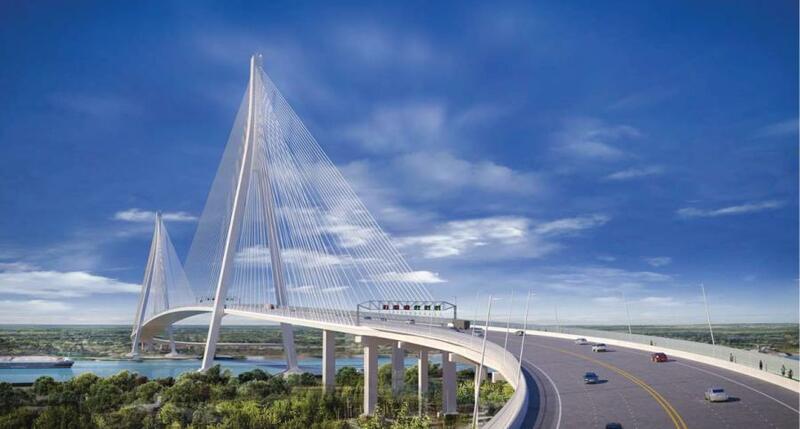 Fluor Corporation announced that Bridging North America, a partnership of Fluor and ACS Infrastructure Canada, was selected as the preferred proponent to design, build, finance, operate and maintain the Gordie Howe International Bridge project for Windsor-Detroit Bridge Authority (WDBA). Fluor plans to book its share of the design and construction contract value in the fourth quarter of 2018. Fluor and ACS Infrastructure Canada led the development phase of the project and will hold the prime contract. This is the second project in the Windsor-Detroit area where Fluor and ACS have partnered. Fluor and ACS recently delivered, and are currently operating and maintaining, the Rt. Hon. Herb Gray Parkway in Windsor, Ontario, that will connect to the Gordie Howe International Bridge. This partnership will design and build the project, and when complete, this crossing will be the longest cable-stayed bridge in North America. The scope also includes building new, state-of-the-art ports of entry on both the U.S. and Canadian side of the Detroit River as well as improvements to existing infrastructure in both Michigan and Ontario. Early works will start this summer in advance of financial close, which is set for this fall.